Jane Christmas is a Canadian humour, memoir, and travel writer who has written three other books, also with interesting titles like this one. 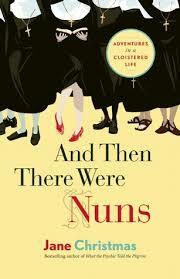 In ‘Nuns’ she focuses on her adventures into the cloistered life. 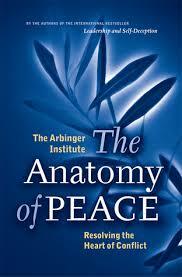 Christmas writes books about personal transformation (in this case also spiritual) and self-discovery. It’s sort of like ‘Eat Pray Love’ with more substance. This is the first book of hers that I have read, but I would say she is like a cross between Elizabeth Gilbert and Bill Bryson. This thoughtful journey includes a lot of interesting stuff about convents, monasteries, and nuns and takes her to Yorkshire (Whitby & York) and the Isle of Wight. She also shares honestly about an unresolved trauma whose memory surfaced in the imposed silence she endured, and needed to be dealt with. After her second divorce and just as she is engaged to be married once again, Jane decides to fulfill a lifelong yearning to enter a convent and road-test being a nun. Her fiancé actually becomes the ‘saint’ in the story, as he lets her go for a year and a half to sort herself out and get this out of her system, knowing full well she may never return. In a peripatetic fashion she visits four different religious communities on two continents, submitting herself to the rules and responsibilities in each. Her account is a respectful irreverent look at the life of modern day nuns and the monastic life. The Pelee Project: One Woman’s Escape from Urban Madness is about what happens when an exhausted single working mother leaves her life of 24-hour grocery stores, 12-hour work days, three-hour commutes, and retreats to a tiny Canadian island. What the Psychic Told the Pilgrim: A Mid-Life Misadventure on Spain’s Camino de Santiago de Compostela is about her 50th birthday celebration walking the gruelling pilgrimage in Spain. Somehow she finds herself leading fourteen squabbling middle-aged women, until she inadvertently loses them and sets out on her own. That is when her real adventure begins, as she battles loneliness, hunger, and exhaustion. Incontinent on the Continent: My Mother, Her Walker and Our Grand Tour of Italy is about a trip to Europe with her arthritic, incontinent, and domineering mother. Historically a fraught relationship, the trip was meant to smooth over five decades of constant clashing. This is the kind of story we read in the paper and want to know every detail about so that we can reassure ourselves that it won’t happen to us. But this couple had done everything right – they were on an island where bears rarely appear, their food was properly stowed, and worst of all, five days later when they were discovered, there was a package of untouched hamburger sitting out even as the bear was still guarding their remains. This was not about the food. Tragedies we cannot predict or explain do happen and we must wrestle with those ‘black dogs’ in our lives. The book is written in a child’s voice which is believable but might be tiresome for some. It was not done as skillfully as Emma Donaghue’s Room to which this book will inevitably be compared. She might have alternated the child’s voice with another narrative which would have given a bit of a break. Algonquin park is one of my favourite places and this story will not diminish my love for it. We all have our own bear stories to share and we all have our black dogs inside of us, no matter where we are. Not that I need one, but there are two reasons why I read this book. A friend recommended it, and I plan to attend a literary festival in London at the end of the month where Sebastian Barry will speak. It’s his new book that the Irish storyteller will be talking about, but since my friend suggested this one, I decided to start with an earlier one. 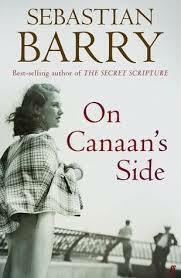 For the fun of it I read a few reviews of ‘On Canaan’s Side’ before I started reading it. One curious comment I remembered as I started reading – the reviewer said that the book was hard to get into but after he’d reached page 30, the story took off. Well, to the page, the reviewer was completely right. After page 30 the story flew off the pages. Barry has a wonderful way with words and his prose is poetic. The flashback style of the book was a bit confusing at first, but when I settled into it, it became comfortable and easy to follow. Despite being a very Irish novel, the story begins in America with an old woman getting ready to commit suicide. Her thoughts drift back to the time when she was a little girl in Ireland with her father and siblings. Her father, a formidable policeman, is involved in a tragic situation that splits the family apart. Lilly flees to America with her boyfriend Tadg Bere. But the safety they had hoped for in the new land, on Canaan’s side, is not to be. Irish violence follows them and ripples through consecutive generations. The promised land is not all it was hoped to be. The novel is beautifully crafted without being overwritten. One reviewer called Barry’s lyricism a “seemingly endless series of potent and moving images” but simply. There’s an economy of words in the descriptions as well as a compelling plot. The scope of the novel is also impressive. Not only does it deal with Ireland’s troubles, but also America’s, with the assassinations and the civil rights movement, and the Vietnam and Gulf wars. I will definitely look forward to reading Sebastian Barry’s other books, some of which are also about the same Dunne family and look forward to hearing him speak! When a book claims to be “truly transforming and powerful” and is written, not by a person, but by a for-profit institute, it makes me immediately suspicious. So I began reading this book about conflict resolution with a bit of skepticism, only to discover that it really is very good. This book just might bring hope to troubled relationships and promote change. I would not hesitate to recommend it to anyone, since it is well written, highly readable, non-threatening, and does have the potential to improve people’s lives. Written in an anecdotal style that reads more like fiction than a self-help book, two unlikely partners Avi and Yusuf (one Arab and one Jewish) run a wilderness experience for delinquent youth. One of the requirements of the program is that the parents commit to a two day workshop when they deliver their children for the 40 day wilderness experience. They think they will learn about how their children will be “fixed” but they could not be more wrong. Avi & Yusuf take the parents on a journey of self-discovery that will forever change how they view their relationship with their children, and also with others. Little changes can make a big difference. The concepts in this book are really not new but the genius is, of course, in taking practical wisdom and framing it in such a way that it makes new sense for us. The lessons in the book are well structured, clearly thought out, consistent, and simple and memorable enough to make a difference. The continual examples in the narrative, help to bring the ideas to an experiential level, therefore the book must be read in full in order to gain the most from it – hearing about the main points will not have the same effect as absorbing the ideas through story. 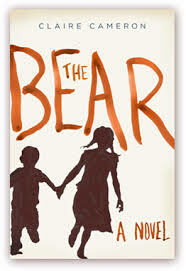 Anne Tyler is one of those great authors whose books you can just pick up and enjoy. Her books are mostly about family and messy relationships. Her characters are vividly drawn without a lot of description, which is always refreshing. You feel like you could meet these people on the street – or even in your own family – and know them. Not a lot happens in this novel, no major twists and turns, it’s just the understated events of three generations and a marriage under the microscope. Tyler plays with the question of what makes a good marriage? Can it survive the test of time and hardship and tragedy and perhaps even divorce? Michael and Pauline seemed like the perfect couple to others, but underneath lies the reality that they are really quite mismatched. But is that bad? Most married people would say that they are quite opposite in a lot of ways. A ‘successful marriage’ is a mystery that Tyler doesn’t attempt to solve, leaving it to the reader to draw the conclusions (although I do believe she hints at her own opinion of Michael and Pauline’s marriage at the end). ‘Amateur’ first struck me as a strange word to use to describe marriage. We use adjectives like: committed, failed, arranged, mixed, etc. Amateur is defined as being engaged in an activity like sport or photography on an unpaid basis. But can a marriage be professional? And then I learned that the word amateur comes from the Latin word ‘amare’ – to love, in other words a ‘lover of’. 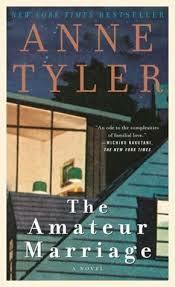 Tyler has written more than a dozen books, some of which have been made into film adaptations. My all-time favourite of hers has to be Ladder of Years. It’s about a mother who does what every mother has probably thought of doing, but never has actually done. One day on vacation with her family, she simply walks away down the beach and doesn’t return. She gets on a bus, heads to another town, and begins a new life with a new identity where she feels that she is more than a “bee buzzing around the edges” of her husband and children. After this shocking casting off all responsibility, it is so interesting and surprising to see what she actually does with her new life! I find that you either really like Malcolm Gladwell’s writing or you really don’t. His critics (there are many) argue that he over simplifies scientific data to support his story telling. His supporters (he is a best selling author) like the way he offers a contrarian view of social and psychological research and explains it all in great stories of real people. His facts don’t always hold together well and his choice of research is very selective, but his stories make you feel good and believe that things can be different. 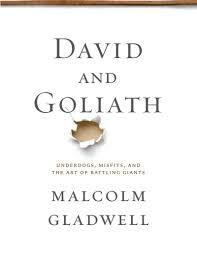 ‘David and Goliath’ follows the tried and true strategy that has made Gladwell’s other books a success. In this book his main premise is that ‘the powerful are not as powerful as they seem – nor the weak as weak’. In the well known story of David and Goliath, Gladwell argues that David was not the underdog in the story – poor Goliath didn’t know what hit him! David’s sling had the power of a ‘fair sized hand gun’ and could easily penetrate Goliath’s skull. Goliath on the other hand was probably suffering from a medical condition that not only affected his size but also his eyesight – he probably didn’t even see David coming. It was in fact, an unfair fight (the other way around). Using this theme of underdogs that are really advantaged, Gladwell takes the reader through story after story reinforcing the argument that obstacles and disabilities aren’t always what they seem to be. Deep down, he is hitting a desire we all have for the underdog to win. His stories are interesting and touching; his questions, not as provoking as they are reinforcing; and his arguments more possibilities than facts. Nevertheless, it is a good read. Gladwell by his own admission is a story teller who wants to challenge the way we think about our world. In David and Goliath he doesn’t so much change the way we think as reinforce what we like to hear. It is in our weakness that we are the strongest. Joseph Boyden has written an honest and epic historical snapshot of Canada in its infancy. Set in Southern Ontario in the 1600’s, it follows the lives of three characters so rich and deeply portrayed I believe they will each stay with me for a very long time. And because three narrators speak of the same events from different perspectives, it gives the story an unforgettable three dimensional depth. It is impressive how simply and lyrically Boyden captures so many turbulent and important themes in one novel. Snow Falls, a young Iroquois girl with special gifts, is kidnapped and adopted by Bird, a Huron elder and warrior. He seeks to fill the gap left by the wife and daughter he has lost, but Snow Falls’ fierce independence will test that plan. The third narrator is Christophe, a Jesuit missionary who has dedicated his life to learning and understanding Huron ways so that he can live amongst them and share his faith. Some of the brutality of war and torture may be disturbing to some, but are handled by Boyden only because he has to in order to be true to the story. He claimed in an interview with Shelagh Rogers of CBC’s The Next Chapter (October 28, 2013 podcast) that these sections were as hard to write as they are to read. But I hope that does not put you off of the novel because you will miss a great deal of beauty as well. I commend Boyden for not shying away from a difficult task and giving us a human story where worlds and world views inevitably collide. The violence in the novel is personal but not gratuitous and if anything, weirdly gentle. Being indigenous to the culture himself, ‘The Orenda’ flows out of Joseph Boyden in a way that brings history alive and makes it jump off the page. An ‘orenda’ is a life force much like a human soul, but inhabits more widely. Animals and trees have an orenda, Lake Ontario has an orenda. As Rogers said in her interview, in this book, Boyden has given history an orenda. 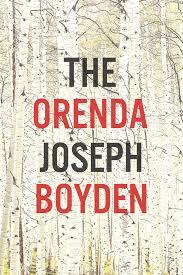 This very week, ‘The Orenda’ is one of the books battling to be dubbed a ‘Great Canadian Novel’ in Canada Reads 2014. Each year Canadian celebrities choose Canadian novels and argue for their choice until one comes out on top. Arbitrary as it may sound (how can one novel be all things to all Canadians), I do commend Canadians for hosting a spirited literary debate in the dead of winter to create some warmth and intrigue! This time I’ve actually read two of the books in the running, the other one being Annabel by Kathleen Winter which was also excellent. ‘The Orenda’ is part of a loose trilogy. It was preceded by Three Day Road and Through Black Spruce, but chronologically comes first.